Twenty years ago, almost to the day, I made the most spontaneous decision in my life… I accepted a job in a town I had never heard of in a country I could just about pin on a map. Following what was a bad choice of University, I was encouraged by my very supportive folks to do something valuable with the time I had ahead before I could enroll on a more sensible course. I signed up to a TEFLA course – (and no, it is not a typo of the famous French brand famed for non-stick cookware)… It stood for Teaching English as a Foreign Language to Adults. After an intensive month to actually ‘learn’ English as a language – (the kind of thing insanely overlooked by the education system here) .. I was ‘qualified’ to teach English. Aged 19 and a ‘certificate’ under my belt, I was in a desperate situation waiting for a job… any English teaching job… to get me out of a rut. – The old teacher quit 2 weeks ago. Students are desperate for someone. ANYONE. Do you want the job? – Me: Ehhr… when does it start and where is it? – Today. East Slovakia somewhere. Near Ukraine apparently. Do you want it? And there you have it, a rare venture into spontaneity and something I wish I had committed to with far greater frequency since. I ended up having an extraordinary experience (I arrived days later), made better in the knowledge that I am still in touch with some of my students 20 years on. So, significant preamble over, what has anything of this got to do with chicken livers and cooking? Well… not surprisingly, my ‘training’ for life in Slovakia, in particular the language, was a tad threadbare. I decided one day to venture to the local butcher, with the plan of trying to find chicken livers. My Slovak is shockingly bad (not surprisingly, as I never learned the language), and a somewhat amusing game of charades followed. As I had not remembered the word for chicken, I thought flapping my arms like a bird making chicken-esque ‘clucking sounds’ would be a good start. Pointing to where my liver is, I then mimed drinking too much alcohol and suggesting the liver was a bit kaput. Amazingly, (though he was very amused by my antics), he presented a tub of frozen chicken livers and I went home to conjure up something with paprika, white wine, and cream. It was not too bad, if I remember correctly. So began my love of cooking offal, and chicken livers is really one of my favourites. Whilst slimy innards aren’t necessary going to win a beauty contest, they not only represent great value for money, but are also really good for you. There is even an article in the Guardian which touches on this very subject. Chicken livers freeze really well too, and defrost quickly. 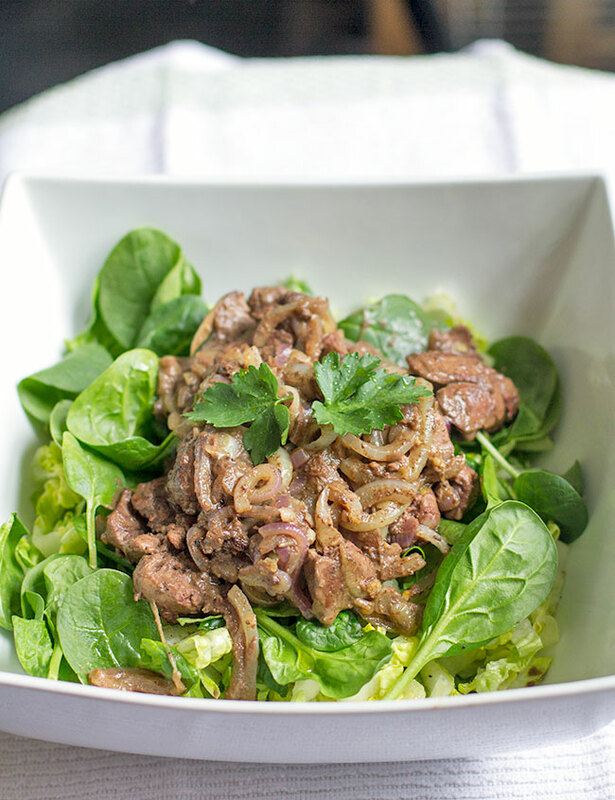 So, ramblings over – if you want to make a slightly different salad for lunch one evening or a weekend quickie (I am talking food here) you can not go wrong with this offal-ish delight – Chicken livers in brandy with spinach and romaine salad. 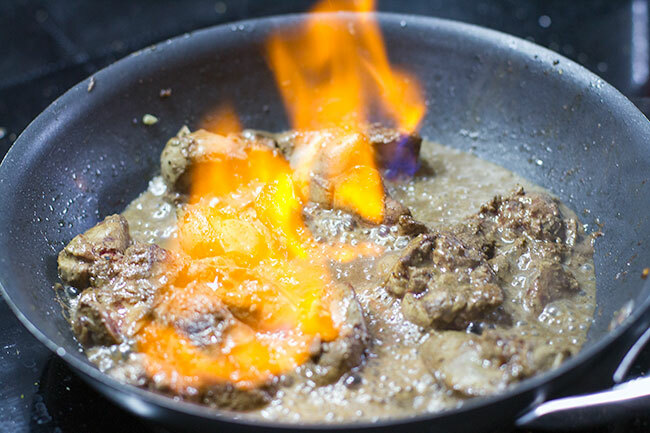 Place chicken livers on kitchen paper, and take out as much moisture as possible. Trim and discard any visible membranes and fat. In a clean, dry plastic bag (I always use Ziploc as they are thick and secure very well) add the flour and seasoning and shake well. Add the chicken livers, seal the bag, shake well (to ensure all livers are equally coated) and set aside. Heat up 1 tbsp olive oil, then add the finely sliced onions and heat for 2-3 mins on a medium heat. Then, add the grated (or finely sliced) garlic, season with seas salt and black pepper, and continue for 2 minutes until soft. Remove from pan, and add second tbsp olive oil, and turn up heat slightly. Add chicken livers, and fry for 2 mins, then turn over and cook the other side for a further 2 mins. Then, pour over the brandy,heat for 20-30 seconds then ignite (be careful!). Turn down to a low heat, return onions to pan, and add Dijon mustard, stirring through evenly. Take a large bowl, add the shredded romaine lettuce, then the baby spinach leaves. Drizzle with olive oil, juice of half a lemon, and season with a little salt and pepper. Pour chick livers over salad, and garnish with parsley.